The evolving market will compel power sector participants to craft innovative business models, offer customer-centric solutions, and create flexible portfolios. There will also be higher consolidation as companies seek funding to expand and introduce novel products. 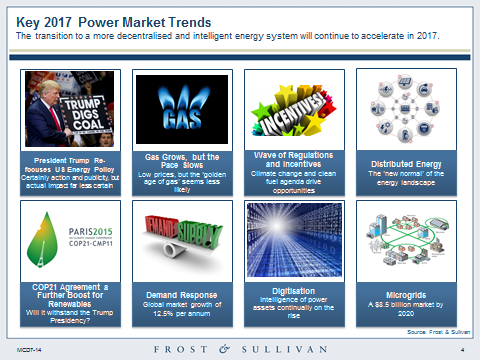 Global Power Industry Outlook, 2017, a new analysis from Frost & Sullivan’s Power Generation Growth Partnership Service programme, examines power market trends, including installed capacity, investment, and regional growth across coal-fired, gas-fired, nuclear, hydro, solar PV, wind and biomass power. High growth rates for solar PV, with investment forecast to increase by 11.5% to $141.6bn in 2017. International agreements, such as COP21, and declining renewable technology costs, will ensure more capacity per dollar invested. China will be the largest market in terms of revenue investment, but the fastest growth will come from India, which will see double-digit growth in investment to 2020. 73.4% of power generation investment in Europe will be for renewable technologies, while Russia and CIS buck the trend and focus on nuclear power and hydro. There will be an overall increase in global coal capacity, even as the utilisation rate of existing coal-fired plants falls in most regions. New business models that incentivise smarter consumption patterns, coupled with growth of energy storage technologies, will reduce the need for peak capacity investment in mature energy markets. Strong investment in hydropower, despite it being a mature technology; China, Asia-Pacific, and Latin America will be key regional markets.